I have received an email from our regular contributor Syd Eade following my last post on recent Great Yarmouth Open Toppers and saying how remiss of me it was not to include an Eastern Counties example. He writes:- How could you have possibly missed out on mentioning Eastern Counties open top VRs in your report!!! 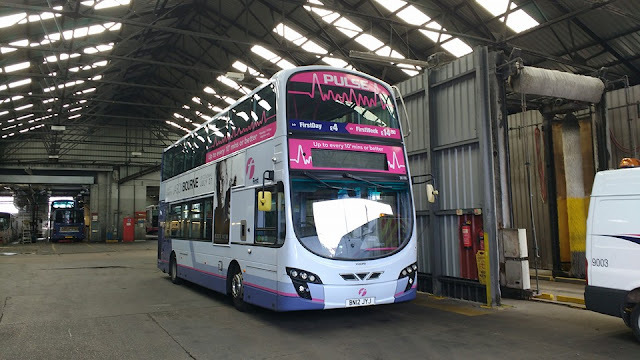 I have sent a photo of one resting in Wellington Road depot to address the balance!! My thanks to Syd for his contribution - balance now addressed! A sunny Saturday morning meant a couple of hours with the cameras to catch up with the recent arrivals at Caister Road. 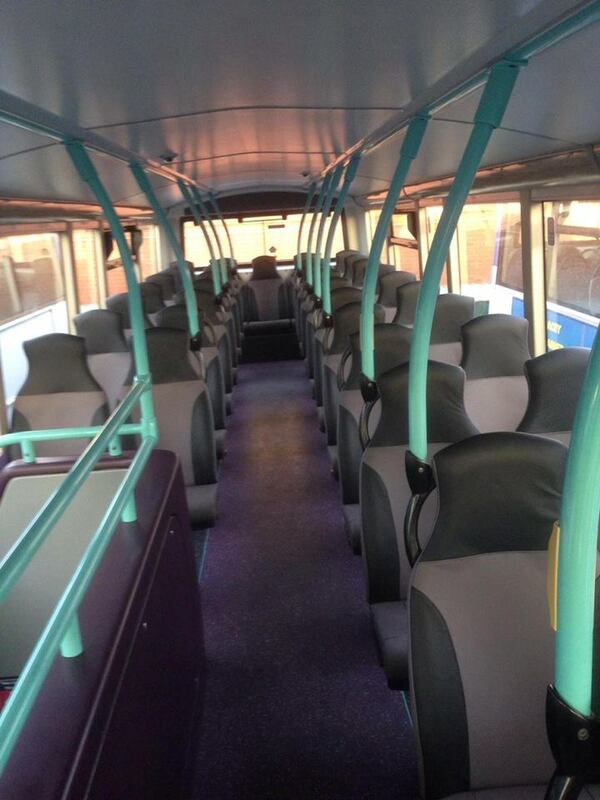 First vehicle on the list was Open topper 32905 W905VLN which was out and about after a brief appearance on Friday. Next on my hitlist were more of the latest arrivals from Leeds, the majority were employed on the 8 service so i did clear a few more off the list. 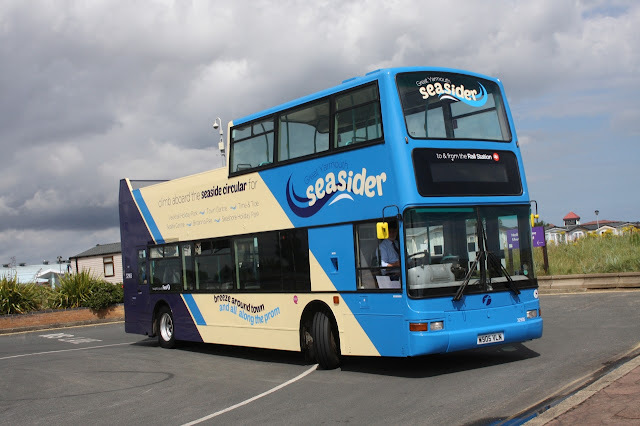 Movements to report include another President heading to the South West, 32211 LT52WTU left Caister Road on Thursday. Also i am reliably informed that 32213/32214 & 32955 are due to move to Norwich next week although this is to be confirmed. The last operator was Awaydays Travel of Wood Dalling of Norfolk which regularly used MCW Metrobus KYV670X in Great Yarmouth Sightseeing livery. Originally numbered M670 in the London Buses fleet, it moved to London General on privatisation, then to City Sightseeing for use in Inverness before passing to Awaydays who operated the City Sightseeing franchise. 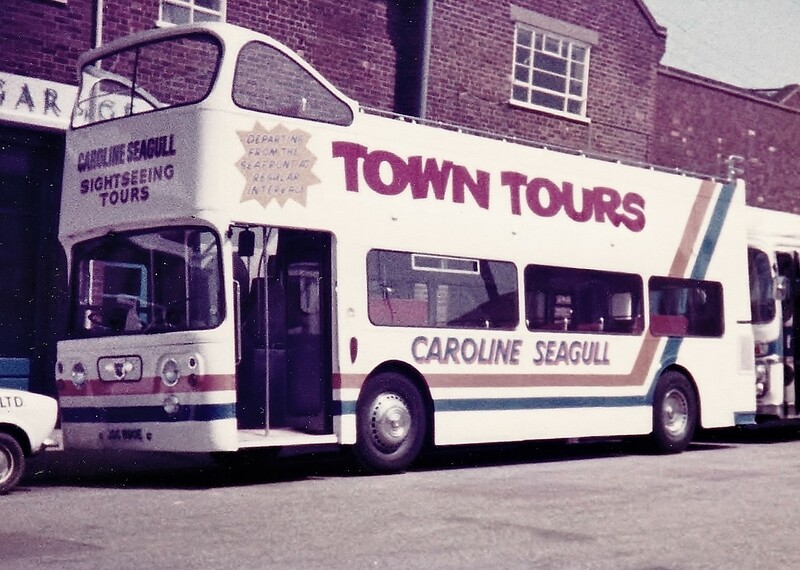 Finally, I found an old photo of Caroline Seagull's open topper former Leyland Atlantean JSC890E. New to Edinburgh (later Lothian) in September 1967, it is pictured outside Caroline's Queen's Road premises during August 1982. I leave you to form your own opinion but, as I have always said here, we report things as they happen and not the rumours of what might happen. However, this is one exception that I thought you all might like to be aware of! 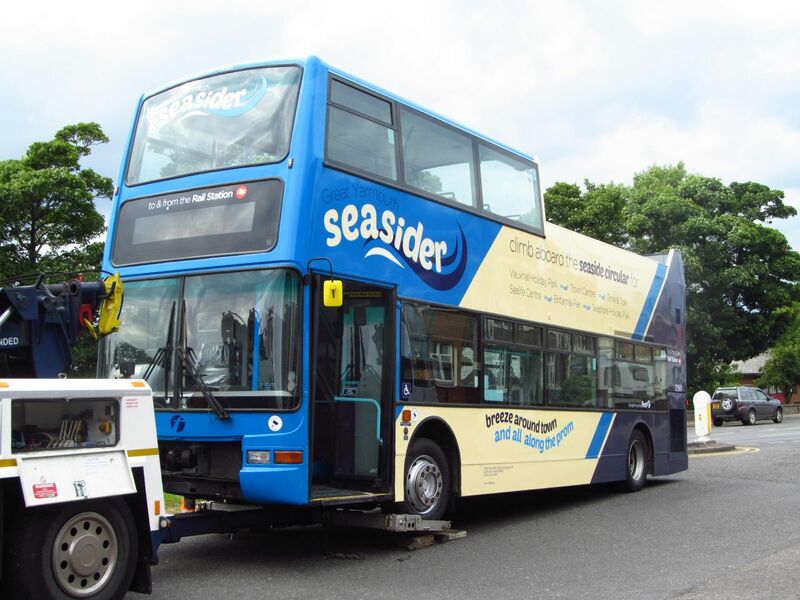 After all the anticipation and teased photographs, Yarmouth's new Open Topper arrived at Caister Road this afternoon with a little assitance from ASW Recovery, this was due to a minor Turbo problem which will soon be rectified. Right place, right time for me as i passed this afternoon! 32905 W905VLN is a Dennis Trident with Plaxton President bodywork, new to First London (Centrewest) as TNL905 in 2000. It has had a brief spell with FEC before moving onto First Essex. It was converted and repainted at Rotherham's Midland Road works into the new "Seasider" livery for the Summer 3 service in the town. 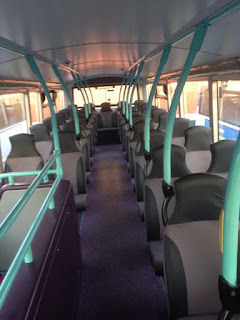 The first of the former X1 Gemini fleet to be refurbished has returned from Rotherham to Lowestoft after having an internal tidy up and some new seating added. 37568 AU58ECJ is now back in Suffolk with former Yarmouth Gemini 37575 AU58ECZ going up to South Yorkshire in its place. Two sets of seats have been removed from either side of the upper deck to create more legroom and the new E leather seating has replaced the tired cloth. 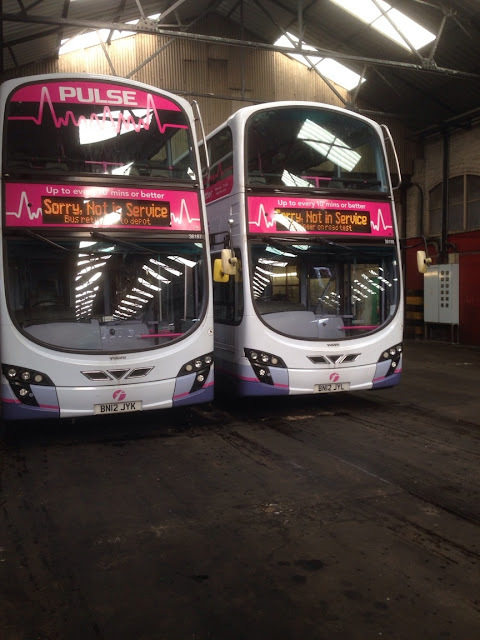 Also currently at Rotherham are 37563 AU58ECA and 37572 AU58ECW both having similar work carried out. 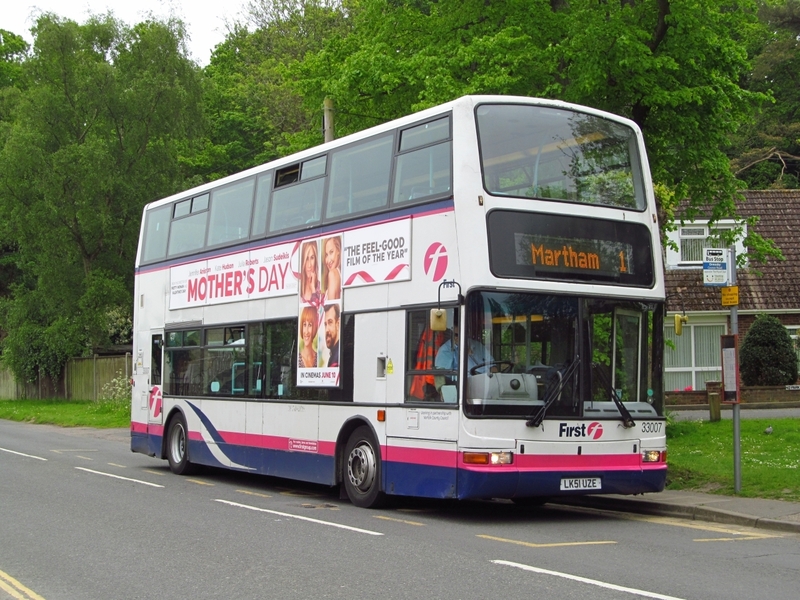 Many thanks to First for the update and Photos. No less than six new arrivals to report for First Eastern Counties today. Starting with five more Volvo B9TL Wright Geminis from First Leeds which were collected from Hunslet Park Depot yesterday. 36186-36190 made the journey to Norfolk with 36186/187 & 188 arriving at Yarmouth and 36189/190 going to Norwich. 36186 & 36187 Pictured at Caister Road last night. Photo First. 36186 at Caister Road this morning. Photo Robert Collins. The final arrival to report is the long awaited Open Topper for Great Yarmouth in the shape of 32905 W905VLN, A Volvo Plaxton President new to First London and latterly with First Essex, it has been painted into a special livery for the Seasider service 3, it is currently at Roundtree Way in Norwich having Vinyls added and its final checks before moving down to Caister Road. Thanks to Robert, Zak and First for the photos and info, Grahame. A further Wright Streetdeck appeared at First Great Yarmouth's Caister Road depot this afternoon and it was another pink liveried example. 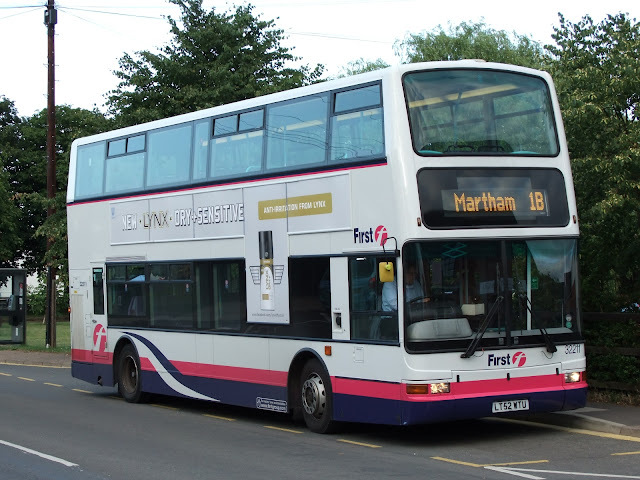 First Norwich 35196 SK16GVV is the third pink bus from the fleet to be seen in the town and Roger Bellward was at the depot to record its presence. My thanks to Roger for the use of his photo. Passing Beach Coach Station during Saturday afternoon, I espied some interesting vehicles on site including two double deckers! As many readers will know my good friend and regular contibutor to our blog James Long passed away suddenly on the 21st of June. Yesterday i travelled to Ipswich to attend Jim's Funeral service and pay my respects. The service took place at the Seven Hills Crematorium on the outskirts of Ipswich. Jim's cortege arrived followed by Viv Carters immaculate RML CUV266C and First VA479 AU53HJV. 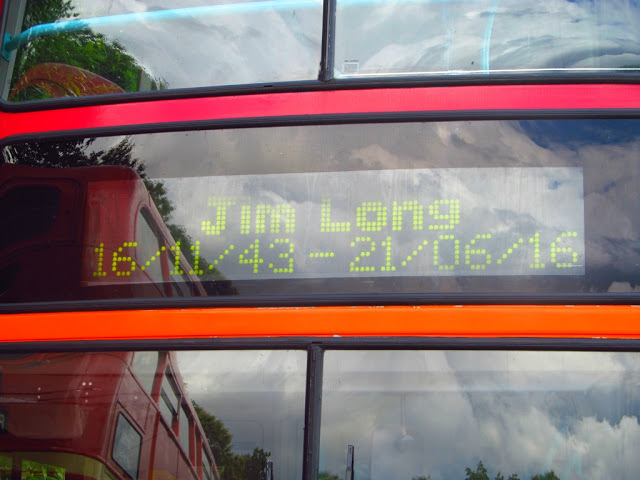 As a tribute to Jim the screen on 479 had been programmed especially for Jim as you can see from the photo above, he would have loved that! It was a very moving service with members of Jim's family sharing their memories of their Dad & Grandad, he was a real family man but had injected his hobby into them with his son Darren describing how he could tell various sorts of buses from a distance thanks to his Dad's enthusiasm! I was joined by Chris Speed and members of staff from First's Ipswich Depot as well as a full chapel of family, friends and former work colleagues including fellow enthusiasts Viv Carter, Maurice Doggett, Stuart McNae and many more. Jim will be sadly missed by many people, he always wore a smile and had time for anyone who wanted to talk Buses, i will miss our chats, texts and emails, i still look now in my inbox hoping one will appear from him but thats not to be, he will be looking down on events now noting all the changes and keeping up to date i am sure. You were a good man Jim and may you Rest in Peace now my friend and as you always said to me after any conversation, email or text, Take Care. Clapton Pond & Corton Road! 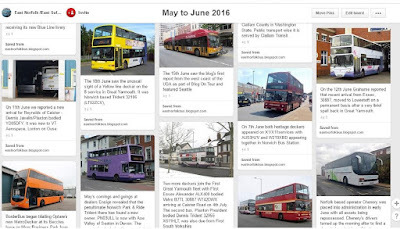 For those that were possibly unaware, two of the former Lowestoft buses at this year's EATM London Event were especially fitted with a blind showing a London destination - Clapton Pond in Hackney. 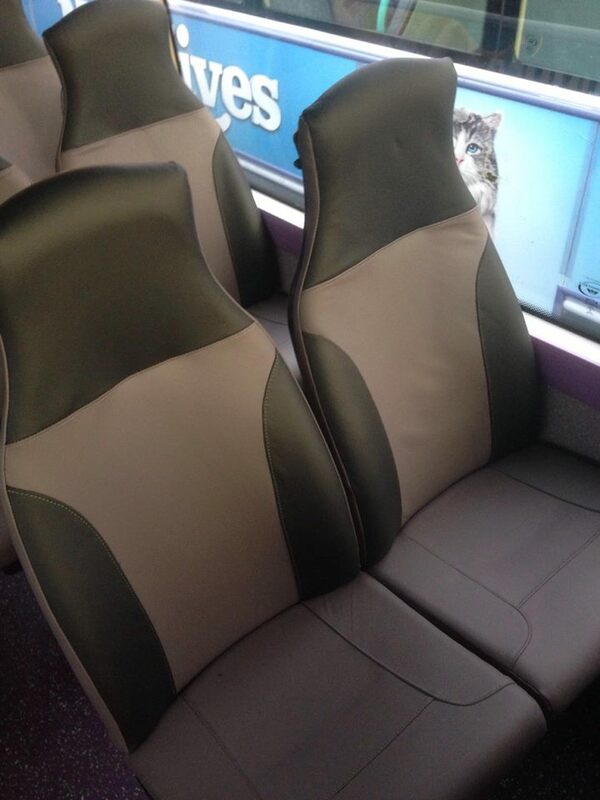 The destination blinds were made by Daniel Peart to ensure the Lowestoft buses fitted into the London themed weekend. 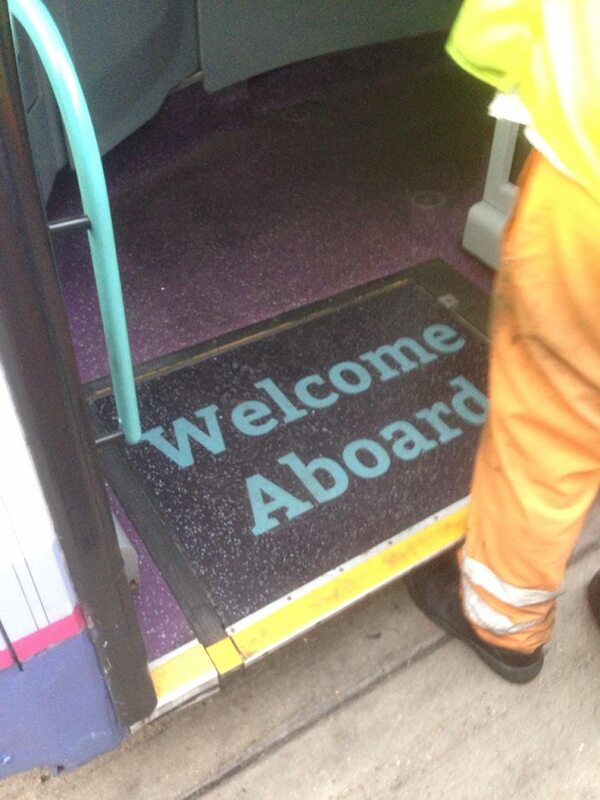 They even carried 'On Hire to London Transport' signs in the front window. Even the Stevensons ex London RTW joined in by displaying Clapton Pond too. 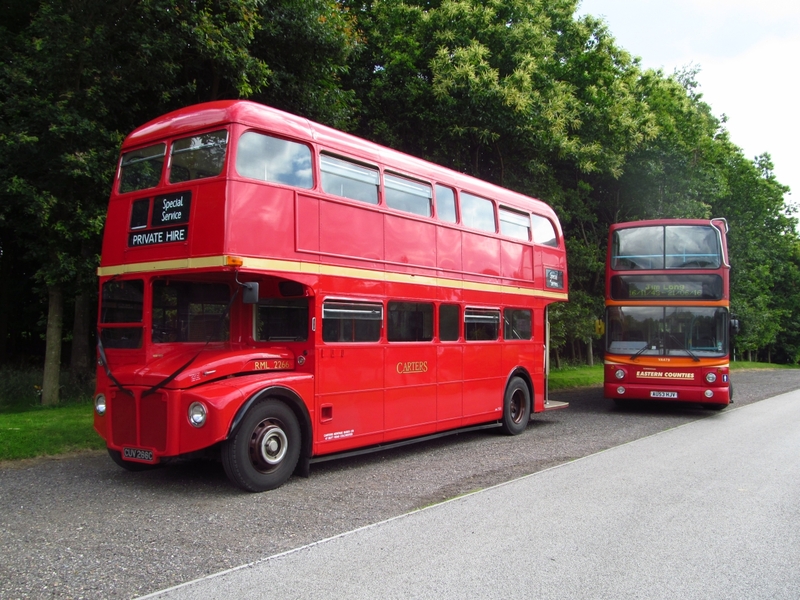 Tradition was not abandoned though and a tour was run by PBJ2F on the Sunday to the old 2 Corton Road terminus in Gunton Drive. 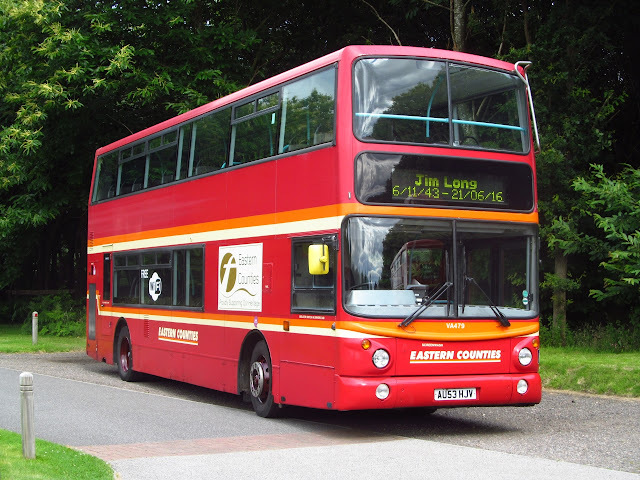 This was abandoned when loop working via Gunton Cliffs was introduced for one man buses some 45 years ago. The above photos were supplied by Syd Eade who began looking through his archives for a photo he had taken of the original Corton Road terminus. However, the nearest he could find was this one showing AEC Regent III LBJ744 across the road. The stop is located behind by the telephone box!!! Earlier today First's Caister Road depot was visited by another Wright Streetdeck; the type is normally based in Norwich. 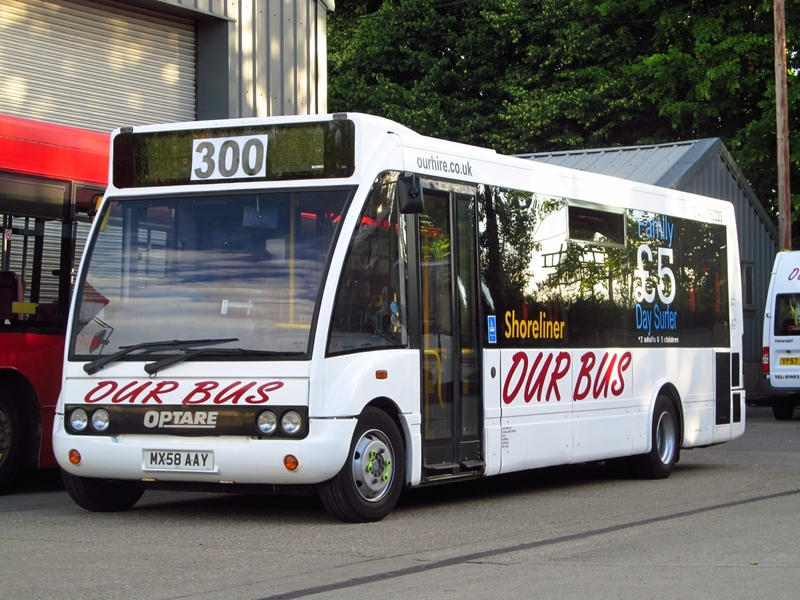 However, it was not a pink liveried version but one in the standard First Olympia colour scheme in the form of 35200 (SK16GVZ). It was photographed inside the depot earlier this afternoon by Roger Bellward although it's not known why it was there. My thanks to Roger for allowing me to use the picture. The tram was London County Council No 106 from Crich Tramway Village. Built in 1903, it was one of a hundred 'B' class built. Following withdrawal in 1926 it was converted into a 'snow broom' and last saw active service in this form in the winter of 1951/2. Escaping the scrapyard, restoration began in 1970 and it subsequently moved to Crich. 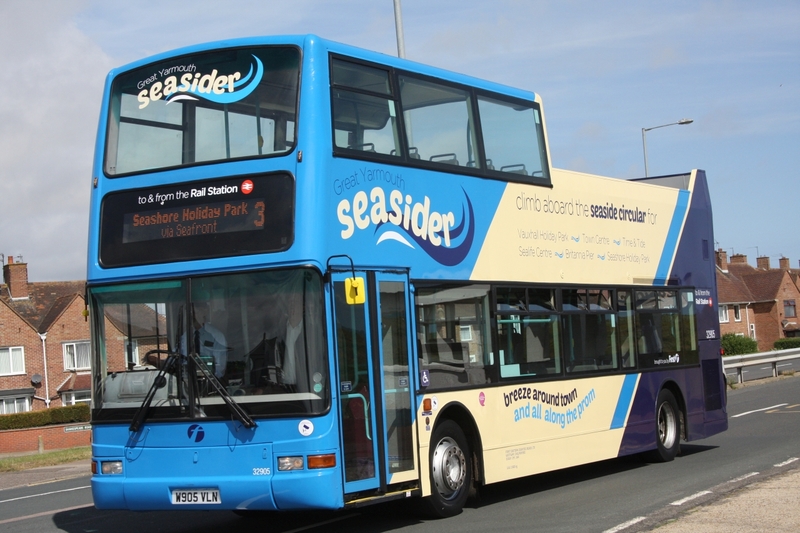 After more restoration in 2010, it was relaunched into service in June last year. I enjoyed my ride on the top deck and I ensured I escaped any 'frying' by keeping my hands below head height as suggested by the guide! Another LT representative was CRL4 (SLT59), a prototype entering the fleet in London Transport's line of Green Line double-decker coaches during July 1957. 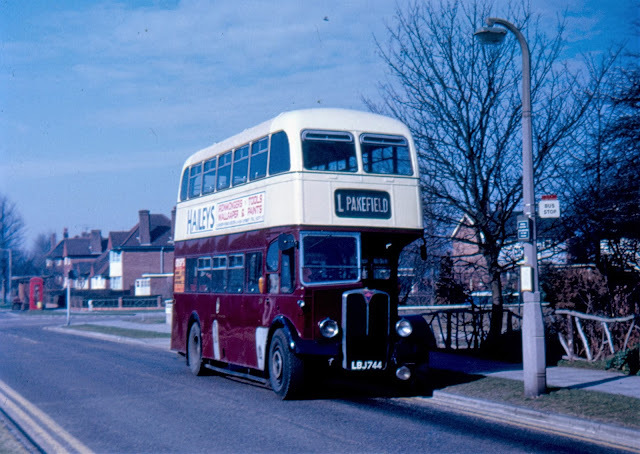 The body was unusual as it was the only Routemaster to be built by Eastern Coach Works. Withdrawal from normal duties came in May 1979. and, after a repaint, it was allocated to Hertford for special duties. In early 2000, there was considerable alarm when Arriva announced that it had been sold. Bids by well-known preservation bodies had been rejected, and there were fears that it had been consigned to the scrap-heap. Fortunately the decker found a preservation home and was restored to Green Line livery. It has subsequently been bought by Roger Wright for his London Bus Company, where it earns its keep on weddings and outings, while providing joy for enthusiasts at Rallies and Running Days. Our final photo is of Stevensons of Uttoxeter KLB908 a 1949 preserved Leyland PD2/3 with Leyland RT6 H30/26RD body. 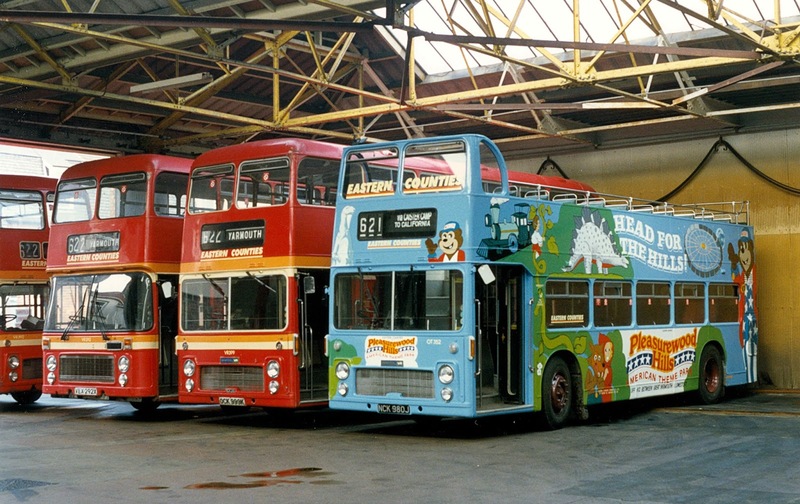 It was originally London Transport RTW178 until sale to Stevensons in 1965 who installed the rear door and modified the destination displays. I would like to acknowledge Iain's Bus Stop website as the source of the history for the many vehicles and my thanks to everyone at the museum for making a very enjoyable occasion. The large number of members involved must have been phenomenal and this effort was reflected in the numbers attending - never seen it so busy. Finally my thanks to Colin White who put up with my company! Transfers, Refurbishements, Repaints, its all go at the moment! Former First Leeds Volvo B9TL's 36182/3/4 have moved down to Great Yarmouth from Norwich. 36185 will be the last to move once repairs are carried out to 33246 which will move back to Norwich. 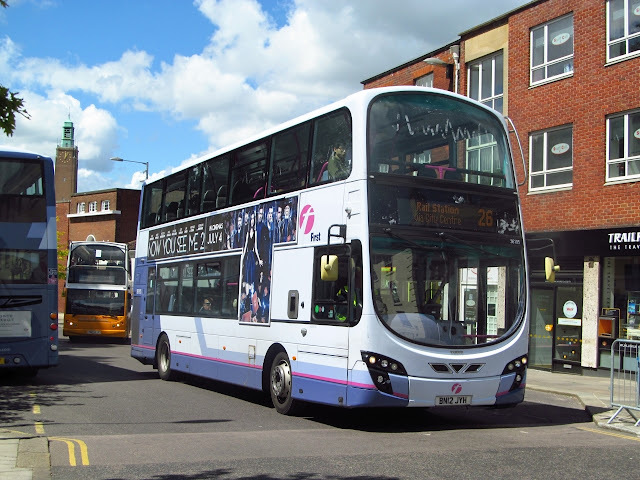 Former Norwich vehicles 33004/33007/33151 have all moved back to city operations from Caister Road with 33246 to follow. 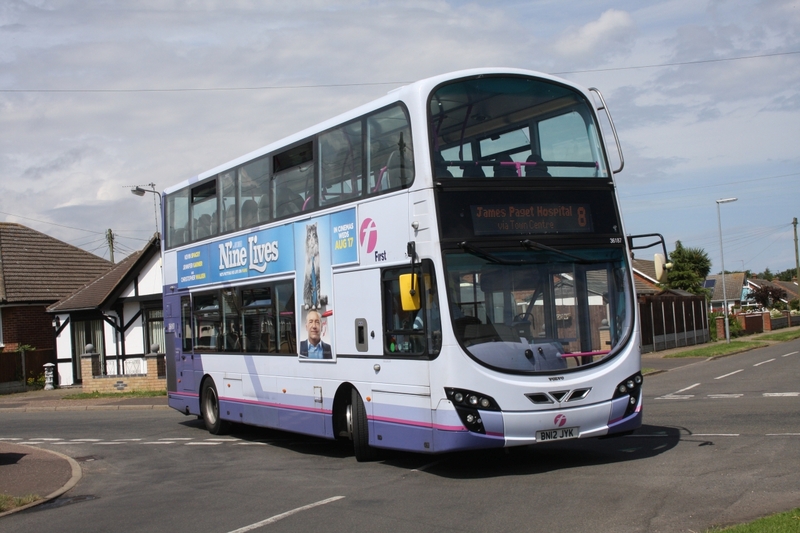 33007 LK51UZE pictutred last month in Ormesby. 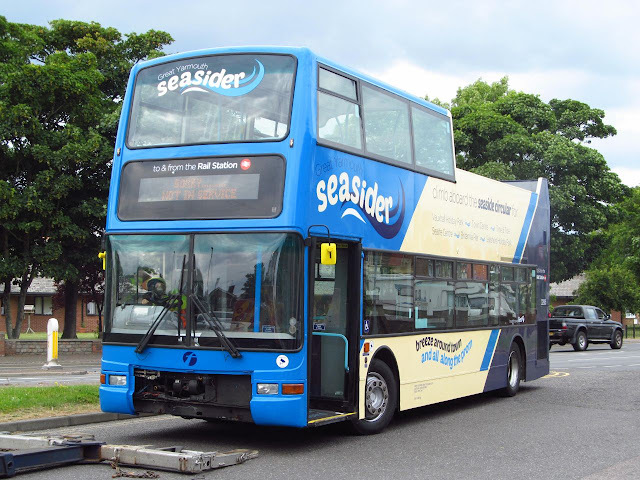 On the refurbishment front Lowestoft Gemini 37568 is expected back from Rotherham with sisters 37563 & 37572 heading North for their work to be carried out, two more Volvo B10BLE are due on loan in return, one being 60622 to join sister 66112 already at work in the suffolk town. 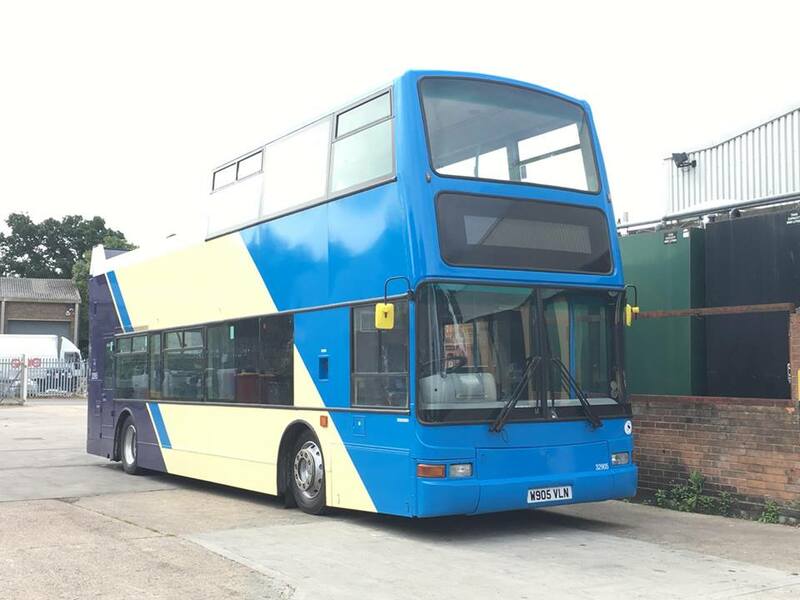 33169 (BD11CFO) has returned to Norwich in the new Blue Line livery joining sisters 36166 & 36179 in the latest colours. 36167 & 36168 are currently at Simon Morris for repaint. Finally i would like to mention the Funeral details for the late Jim Long, Jim's service will take place on Thursday 14th July, 3pm at Seven Hills Crematorium in Ipswich. I will be attending to pay my respects to a dear friend.